The Tent of Tomorrow may usher in a new future. Two men want to transform that empty shell and much of the rest of the New York State Pavilion in Flushing Meadows, into an air and space museum. 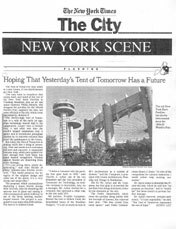 Philip Johnson, who designed the pavilion for the 1964-65 World's Fair, supports the idea. "It's just sitting there, slowly deteriorating," said Alan Ritchie of Philip Johnson/Alan Ritchie architects. "This would preserve the integrity of the original design and make use of the space. It's a very strong and sound idea." The project is estimated to cost more than $100 million. Architect Frankie Campione likened the tent to Ebbets Field, the demolished home of the Brooklyn Dodgers. "It's not so much an icon of 60's architecture as a symbol of Queens" said Mr. Campione, Principal of CREATE Architecture Planning & Design of Manhattan. But for Mr. Aybar and Mr. Campione, the first goal is to prevent the pavilion from being destroyed, either by the elements or the city.